President Abdulla Yameen Abdul Gayoom announced Tuesday that Saudi Arabia has increased the Hajj quota to Maldives by 1,000. He made the announcement at Madaveli, Gaafu Dhaalu Atoll, during his ongoing official visit to Huvadhu. Yameen declared that the additional quota was granted as a result of the deepening ties between Maldives and Saudi Arabia. He shared that pilgrims would be able to go on Hajj pilgrimage under the additional quota this year. Previously the Hajj quota for the Maldives was only 1,000. 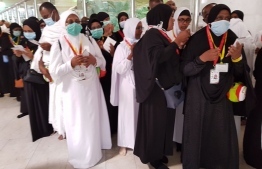 Pilgrims have already started to depart for Saudi Arabia, via the Hajj Corporation and four other associations authorised by the government.